My first journal is full of entries like this: “dear diary” entries recounting my day and how I felt about it. I recorded everything from how God was answering my prayers, to what my friends and I scored in putt-putt. Ha! Don't get me wrong, it's fun rereading my pre-teen thoughts. (Especially now that I have often spent over 30 minutes being indecisive about decor and that self-checkouts are standard in many stores.) But chronicling your life is not the only function a journal can serve; those blank pages can be used in so many other ways! In a sermon about how to have a quiet time, our former pastor would include a photocopied page from his journal. It was so helpful to have a tangible example of what it looked like to engage with God. Something that once seemed daunting and unknown became attainable. It is for this same reason that I share some pages from my own journals. I hope this will get the creative juices flowing as you consider what it could look like for you to engage with God and seek Him with all your heart. Below are some functions your journal can serve. "We are taking every thought captive to the obedience of Christ." (2 Corin 10:5) The first step in capturing wayward thoughts is first identifying what they are. Sometimes this is hard for me, specifically in highly emotional or stressful situations. I may have a general sense of anger, hurt, or anxiety, but am unable to discern what the root of that emotion is. Using my journal as a tool, I write out all the reasons I might be angry. Sometimes that practice alone is sufficient to help me figure it out. Other times I ask God for help: "Search me, O God, and know my heart" (Ps 139:23) In time, He usually brings clarity. I am then able to "make these thoughts obedient" through specific actions made clear through this exercise, whether repenting, forgiving or having a conversation. Many times simply writing out untrue thoughts strips them of power, especially when coupling them with truth. If you read my last couple posts, you will see that Bible reading is invaluable to me. I am a different person primarily because of the hours I have spending in the pages of this Living Book. But gaining knowledge is not enough; we must learn to be doers of this Truth. For me, this process starts in my journal. My Bible reading is like tasting and my journaling is like digesting; it is the transitional phrase between learning and life-change. Here are a few examples. 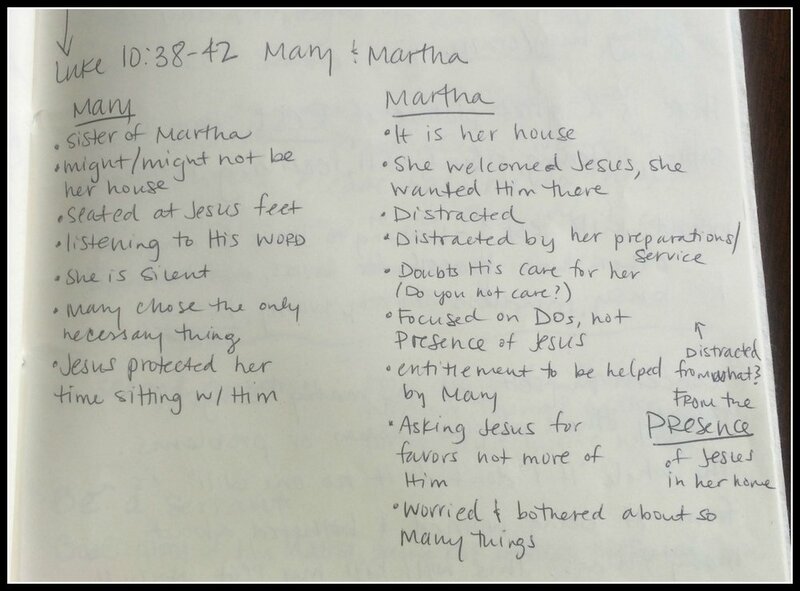 While reading the story of Mary and Martha in Luke 10, I decided to make a comparison chart to help me see in more detail what it looks like to love the presence of God more than doing things for Him. 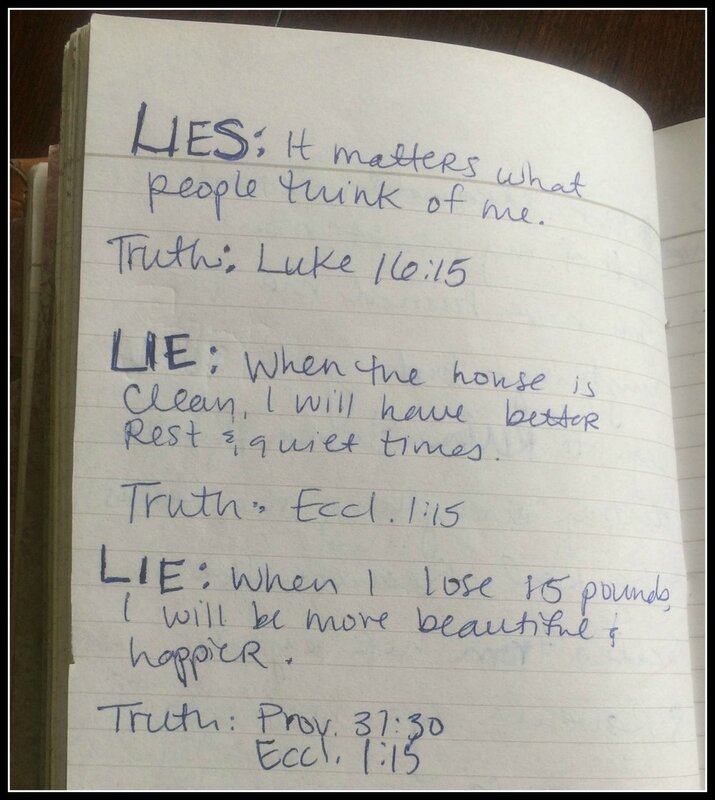 Comparison charts have become one of my favorite things to do as I read the Bible. When I finish a book of the Bible, I'll often write out what I have learned from the book and what was most striking to me. This helps me remember what I read and apply that knowledge to how I live. In a difficult season of life, I inserted myself into the story of Bartimaeus the blind beggar in Mark 10:46-52. This practice gave me a different perspective on this story and how Bartimaeus might have felt in that moment. While reading John, I decided to keep a list of all the times Jesus says “Truly, truly, I say to you…” to see what He emphasized during His ministry. List-making as you read can be very eye-opening. There are other books of the Bible with repetitive elements (Judges, 1&2 Kings, Leviticus) to list. Or you could list prophecies about Jesus through the book of Isaiah. Or keep a running descriptive list of who Jesus is as our High Priest through the book of Hebrews. My journal also contains notes on word studies and other research. 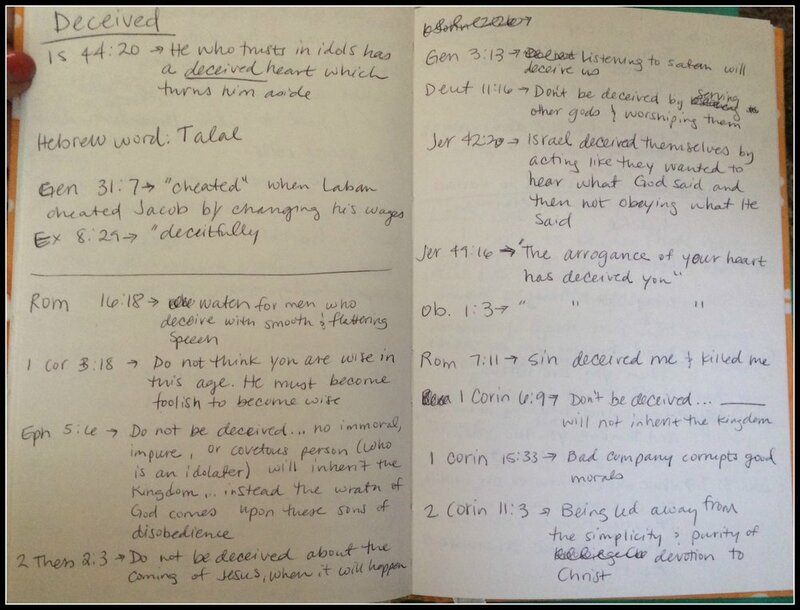 Here is a study on the word "silence" as well as notes on the concept of being deceived throughout the Bible. The first step I take in memorizing scripture is writing it down. Copying verses word-for-word forces me to think about the words purposely and slowly, while seeing how they visually look together. Sometimes I write out verses from my daily reading that stuck out to me. Even if I don’t intend to memorize them, it is a way to meditate on them and get them in my heart. To meditate is to think deeply or carefully about something. As I read the Bible, I will often sense that God wants to massage a specific truth into my heart. Meditating is a way I can respond to that prompting, instead of rushing quickly into my day. My journal becomes a place to mull over verses or sections of scripture, to look at them from different angles, or to think on them for extended periods of time. Sometimes this looks like doodling a verse as I think about it. Other times it's putting certain concepts into picture form. I find it helpful to pray out loud or to write my prayers out. When I try to “pray in my head,” I usually just end up thinking about something else and do little talking to God. My journal is a tool to keep my mind focused on God and the subject I am praying about. My journals hold a record of the most significant days of my life: days when God's presence was nearly tangible, the day we got engaged, days we saw God's extravagant provision, significant dreams I had. How often I have referenced these records and how quickly my soul is strengthened by remembering His faithfulness over the years. This is invaluable. 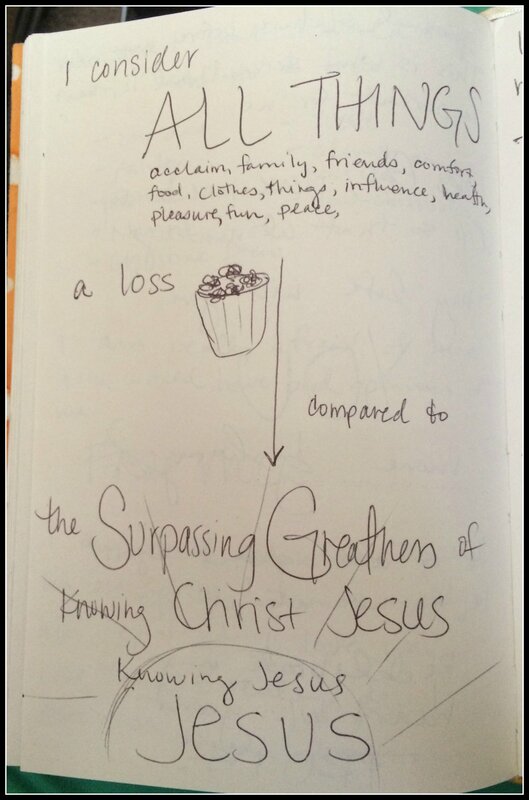 Below is a simple example of recording God's grace during our 3rd anniversary vacation. 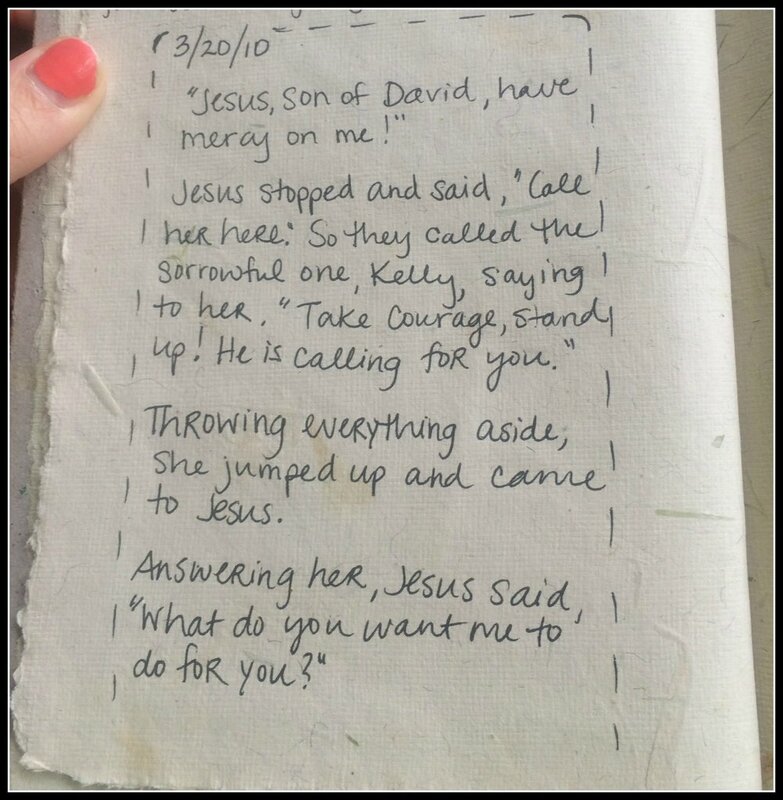 I also use my journal for sermon notes, to-do lists, and prayer requests. 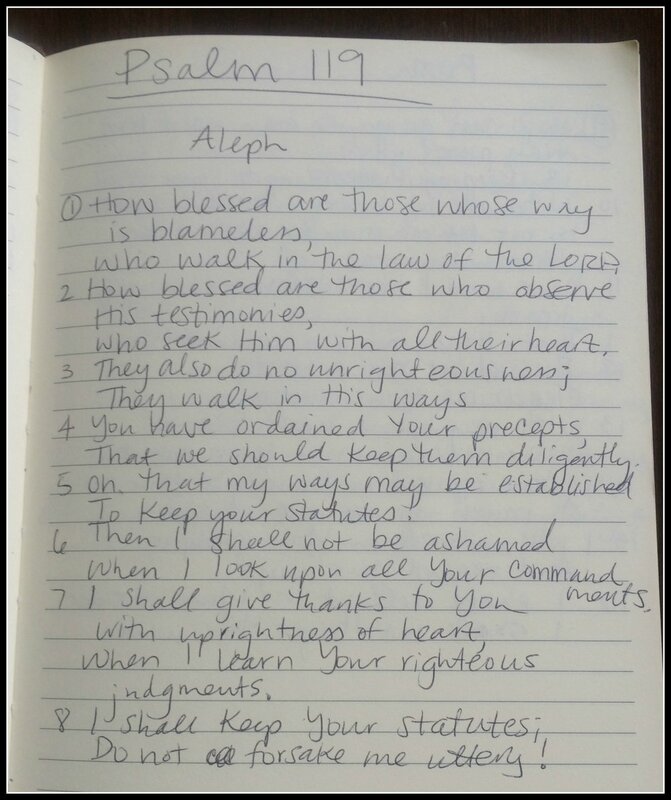 Since most of my journal is directed prayerfully to God, what a better place to keep to-do lists? It reminds me to serve God instead of my to-do list, always submitting my plans to Him. I often find myself assaulted by random tasks I need to remember during my time with God. My journal is a place to write them down and then continue my conversation with God undistracted. I love journals that inspire me! If I like the cover and feel of the pages, I am more likely to use it. Not only that, I have sometimes bought journals to reflect the season I am in. Jimmy, on the other hand, has used the same 5-star notebooks since he was in high school. We are all different and will engage with God in different ways. Please don't feel obligated to implement every idea here. Use what works for you and throw out what doesn't. 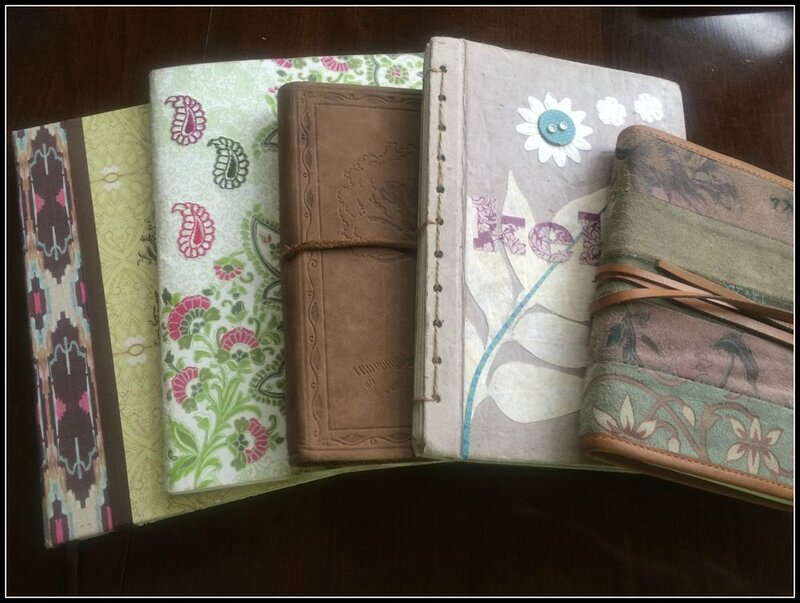 Come up with entirely new uses for your journal! My hope is to inspire you by showing some of the many options you have in journaling. How do you journal? Any other ideas for using this versatile tool? If you currently don't keep a journal, will you consider starting today?